They've been married for three years and have two children together, but it took the longtime friends a really long time to get there. 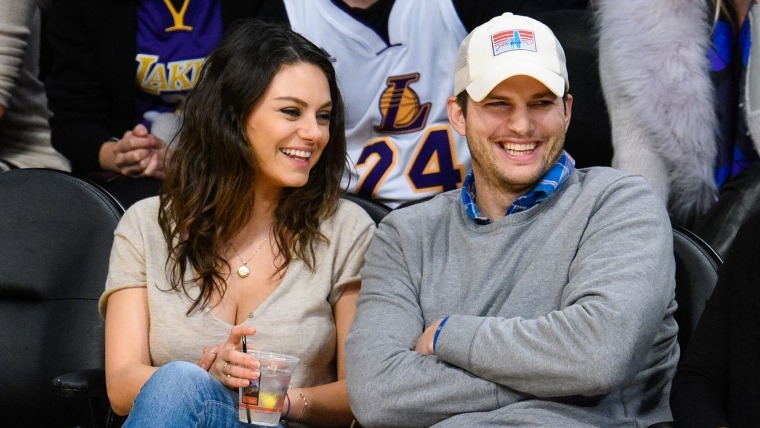 Mila Kunis and Ashton Kutcher's journey from co-stars and friends to partners and parents was a long one — and, according to the actress, it was one they never intended to make. In a new interview, Kunis opened up about the origins of their romance and revealed why it didn't happen much earlier. The stars first met on the set of "That '70s Show," when she was just 14 and he was 19, and as fans of the series know, they played each other's love interest for much of the show's 8-season run. But despite on-screen chemistry and made-for-TV make-out sessions, they were nothing more that platonic pals off screen. "Yep, in the show (we kissed), with no feelings whatsoever," Kunis explained to comedian Marc Maron for his "WTF" podcast. "It's the weirdest story that nobody believes, but it's the god's honest truth. There was nothing there, and it was like ... whatever." And looking back now, at the age of 34, part of her regrets that. "We could have spent 20 years together," she said of how long they would have been together if they'd made a love connection back then. But there was never really a chance of that happening — and not just because she was way too young for that when they met. "We would have never been together if we didn't both go through what we went through in order to be the people that we were when we reconnected," she insisted. That included long-running relationships with others — in particular, her romance with actor Macaulay Culkin and Kutcher's marriage to Demi Moore — and the life lessons that came with them. However, even then, neither imagined they would have a future together until they stumbled into one. "We were at an awards show, and I was backstage," she recalled. "I was like looking around, and there was like a really beautiful man from the back. I was like, 'What a very nice stature of a gentleman.' I was literally, like, 'Ooh, he's kind of hot.' I was single. And then he turned around, and I was like, 'Oh, my god! It's Kutch!' I thought it was the weirdest thing that I was checking this guy out, and it was somebody I'd known forever." Soon enough, the duo went from friends to friends-with-benefits. "We never dated," Kunis continued. "Let me be clear — Ash and I hooked up. Literally, I did a movie called 'Friends With Benefits,' he did a movie that was very similar, 'No Strings Attached.' We lived our movies out." That went on until one of them felt something more than friendship. "I walked up to him and I was like, 'You know what? I actually care about you, and I don't wanna mess anything up, so I'm just going to walk away before it becomes too much,'" she recalled. "And he was like, 'Got it.'" Of course, since they're now married and have two kids together, that wasn't quite the end of the story. "The next day he showed up to my house, and he was like, 'Move in with me.'" Her reply was a simple "OK."
But it wasn't so simple for someone else when Kunis shared the happy news. During a recent chat on Dax Shepard's "Armchair Expert" podcast, she revealed that her mother had a particularly memorable (and hilarious) reaction. "We were driving up Laurel Canyon, and I was like, ‘Mom, I have to tell you I’m dating somebody,'" Kunis said. "And she was like, ‘Oh, tell me! Who are you dating?’ And I was like, ‘You’ve got to brace yourself for this one. ... I’m dating Ashton Kutcher.’"
To which Kutcher's now-mother-in-law responded, "'Shut the f--- up!' in Russian."